Continuing the study of this area in Cepheus, here is the IC1396 region in Hydrogen Alpha narrowband with my 135mm SLR lens. Read more for the full image. I'm still breaking myself in gently during my revival of astronomy and astrophotography with some wide field images. Using an inexpensive 135mm lens and my artemis 285 camera I've captured four hours of data of the IC1396 region which is close to the previously imaged SH 129 region. This large region of fairly strong nebulosity is unusual it that it doesn't actually have a name! I can't think of a good one, can you? 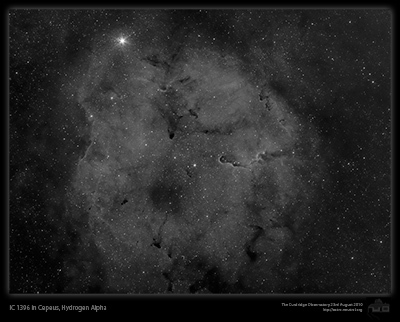 The larger full sized image of IC1396 in Hydrogen Alpha can be found here. This was a very clear night, but featured an extremely bright Moon. It is difficult to image faint targets during the full moon, even with a narrowband hydrogen alpha filter. The broadband moonlight simply raises the background level and ruins small contrast differences in faint regions. Such targets are best felt for moon free nights. When moon is bright we concentrate on full frame brighter targets. As usual, I went to bed and left the telescope capturing frames until it reached the pier at about 2am. The system shuts off automatically at this point. This gave me four hours of good 15 minute frames. The obvious thing to do is try and get the other two panels and make a mosaic of the whole IC1396 and sh 129 region.. but that requires some more clear nights. Last night was temptingly clear, but there were enough clouds to ruin any serious imaging work - besides, I had a few other things to concentrate on which I will post about shortly.